“Contagious” is certainly an apt description. For the last decade, as its audience has grown, it seems that TADA’s musicals have been causing an epidemic of sorts in the Lincoln community. If that’s true, then the Rooks – Bob is the managing artistic director, and Cris the musical director – are Patient Zero. TADA (it stands for “The Arts Deserve Attention”) has become a fixture on the Lincoln theater scene, staging several shows a year at its home in the Haymarket’s Creamery Building. TADA was not the Rooks’ first experience in the performing arts, though. The two met as undergraduates at Nebraska Wesleyan, where both were studying theater – Bob focusing on acting and Cris on opera and musical performance. Bob had come into theater in high school, while Cris had been singing and performing since she was 12. “For me,” Rook said, “(theater) just became an outlet to express myself.” It allowed those who were shy, introverted or otherwise quiet to step out to the forefront, he said. 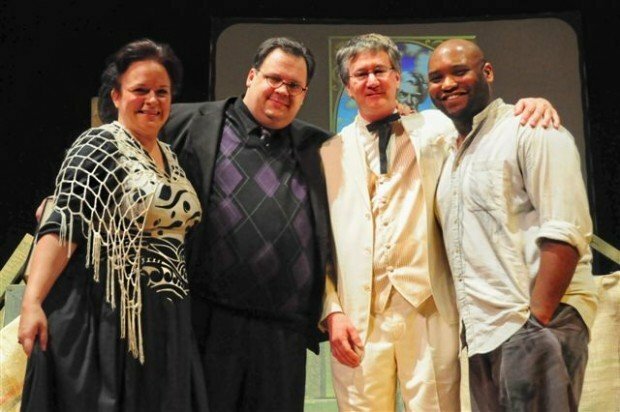 Both have been involved in numerous roles in the Lincoln theater scene. Cris earned a master’s degree in music performance and has performed in a number of musicals. Besides numerous acting roles, Rook worked as a stand-up comedian, touring with Roseanne, Larry Miller and Norm MacDonald, among others. He also served as managing artistic director for the Haymarket’s Star City Dinner Theater from 1997 to 2001. Eventually, the two produced the Midwest premiere of Jekyll & Hyde, a musical based on Robert Louis Stevenson’s novella. They had been approached by the rights holders of Jekyll & Hyde, which they eventually staged at the Rococo Theater in 2002. It turned out to be an overwhelming success. Rook noted that they started TADA, then, “by accident”: the success of Jekyll & Hyde led to another project, then another. But it wasn’t until “Gilligan’s Island: The Musical” in 2008 that TADA fully emerged. “It really put TADA on the map,” Rook said. Gilligan proved popular with local audiences, and TADA, which had been sharing space at the Loft at the Mill, moved into its own theater on the second floor of the Creamery Building. TADA’s space now includes a stage and seating, a second stage (used often for standup comedy), a bar, offices and a full green room. It also has a scene shop in the building’s basement. TADA’s success has allowed it to wrangle the rights to a number of shows that might not have otherwise found their way to Lincoln. TADA was one of the first in the region to put on “25th Annual Putnam County Spelling Bee,” and “Happy Days: A New Musical.” This July, it is presenting “Avenue Q,” which Rook said took him more than three years to secure. One might imagine that being married and coworkers could prove difficult, but the Rooks indicated it hadn’t been much work. “We know what to expect,” Cris said. “We have confidence in each other,” Bob added. The Rooks have a 17-year-old daughter, Megan, who has worked behind the scenes of a few shows. Ultimately, working with each other seems reassuring for them: in theater, they said, trusting your coworkers is essential. And the Rooks trust each other. Cris, indeed, shares her husband’s view of “intimate and contagious” theater. For Amanda McGill, state senator and newbie TADA performer, it was easy to trust the Rooks. “It’s clear that Bob and Cris have had a lot of fun together over the years,” she said. McGill said she had always wanted to get back into theater, and eventually landed a part in “The Spidey Project,” a musical parody that TADA put on in April. “Bob and Cris are both extraordinarily talented and complement each other very well,” McGill said. So far, the audience is dictating that TADA should keep the shows coming. KLKN anchor Rod Fowler, who serves as president of TADA’s board of directors and has known the Rooks for years, said TADA’s success is because of the couple’s hard work.